Last week I reviewed a fabulous contemporary romantic Christmas movie, The Spirit of Christmas. This week I am shifting the focus back to an old holiday classic. Christmas in Connecticut may be over 70 years old, but it is far from outdated. It is simply a fun movie about a woman who gets caught in her deceptions and tries desperately to cover her tracks, and keep her job! Barbara Stanwyck takes the lead role as Elizabeth Lane in this Christmas romantic comedy and Dennis Morgan plays the part of the unsuspecting soldier who joins her "family" for Christmas. For some of you it may matter that this movie is in black and white. It has not been colorized like some of the old classics. For me, I enjoy the step back into a simpler time and a movie that stands on it's own as pure entertainment. Elizabeth Lane is an extremely popular journalist who claims to be a fabulous cook, a wife, a mother, and the ideal homemaker. She is able to write well enough that no one even suspects she is unmarried and completely clueless about preparing food. Even the publisher has no idea she is a fraud. Christmas in Connecticut (BD) [Blu-ray]The story takes place during WWII. Jefferson Jones is one of two survivors when his naval warship was torpedoed by a German submarine. He and his fellow survivor spent 18 days in a raft on the ocean. Needless to say, they were literally starving and Jefferson dreamed of a fabulous meal anytime he slept. When they were finally rescued and hospitalized, Jefferson could not eat solid food and was placed on a milk diet. He continued to crave a real meal. He was so desperate to eat, that he even proposed to one of the nurses so she would take sympathy on him and bring him food. After 6 weeks in the hospital, and many meals, he was no longer anxious to get married. The nurse thought that if he simply experienced a home for Christmas and observed how wonderful it could be to have a wife, that surely he would follow through and marry her. She wrote Alexander Yardley, the publisher of the magazine that employed Elizabeth Lane. She requested that they extend an invitation for Christmas to this soldier who had been through such an ordeal and had no where to go for the holidays. In response to the letter, Mr. Yardley insisted that Elizabeth Lane and her family include Mr. Jones in their Christmas celebration. No only that, Mr. Yardley invites himself to come spend a few days with them for Christmas too. That is where the fun begins! Elizabeth must find a farm, a husband, a child and learn to cook outstanding meals in a few short days before Mr. Jones and Mr. Yardley show up to join her and her family for a Christmas in Connecticut. What a lovely way to describe it! I do love the old B&W movies myself. I have never heard of this movie but it sounds like a lot of fun. Christmas in Connecticut sounds fun in real life too. I haven't heard of this movie either, but, it sounds like it's right up my alley. I love old classic tales that make you laugh and become involved with the characters. This movie sounds like it would do just that. Thanks for a great review, I will have to keep my eyes opened for that one. Sylvestermouse, I had to come back to tell you I had the opportunity to see "Christmas in Connecticut tonight. You are right - it's a delightful and charming movie and I thoroughly enjoyed it. I haven't seen this film is some time. It's certainly one to put on the holiday list. The whole baby thing is so comical and the scenery is lovely. Good choice! 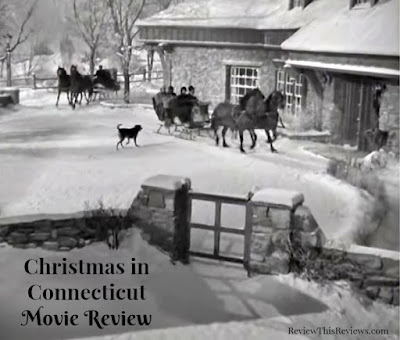 I thought for sure I had seen Christmas in Connecticut, and maybe I did watch it years ago, but if so I've forgotten the plot, the sound of which I absolutely love. Definitely putting this on my Christmas watch list! Now that's a movie that's right up my alley. Great review. I'd love to see this. Guess I'll wait for next year.